Use New Power to Build a Movement - What is New Power? It is not just a change in technologies that is reshaping our world, our culture, and our participation in it. Our beliefs and expectations for what is possible, and what ought to be possible, is also changing. This is eclipsing the old lessons on the right way to create and sustain movements. There are a new set of cultural and tactical rules for how to reach people, how to get them involved, and how to create real change together. Want to start or build a community? To change some local policies? To build a movement online? Try New Power. 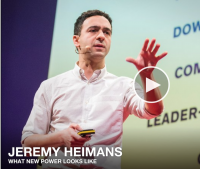 A recent article by Jeremy Heimans from the video above, and a colleague Henry Timms, both activists for people-powered movements, is called ‘How to build a successful movement in 4 steps‘ — available on TED Ideas. Find the most influential people within your space, and connect with them strongly. Understand what they need and how to help them. They can be your absolute best allies and advocates, motivating their audiences for you. Define, talk about, and live your ethos: what do you believe, what do you stand for, and what are you doing to prove it. Shape your offering or message around empowering people to be a part of the movement you are dedicated to. Make it easier to participate. Frictionless signups, notifications, surveys, petitions, donations, etc., are key. People want to be a part of something greater than themselves, and are willing to sacrifice for it. Make that easy to do! Give people small low-barrier asks for them to start helping. For those who get involved, give them the opportunity to take the next small step to help. Continue this to give people clear steps to get involved and offer more support. The Old Power model about how to get people motivated is to make them Comply or Consume. New Power is not always used by the forces of good, and New Power is not destined to be inevitably victorious. However we are only at the beginning of seeing how New Power can dramatically reshape the world of participation in a short period of time. This all means that you and your community are more powerful than you have ever been on this planet. Use that fact to inspire you to plug in, and to start or participate in a worthwhile movement! You can read more about this model, and how to use it, in their book: New Power: How Movements Build, Businesses Thrive, and Ideas Catch Fire in Our Hyperconnected World by Jeremy Heimans and Henry Timms.